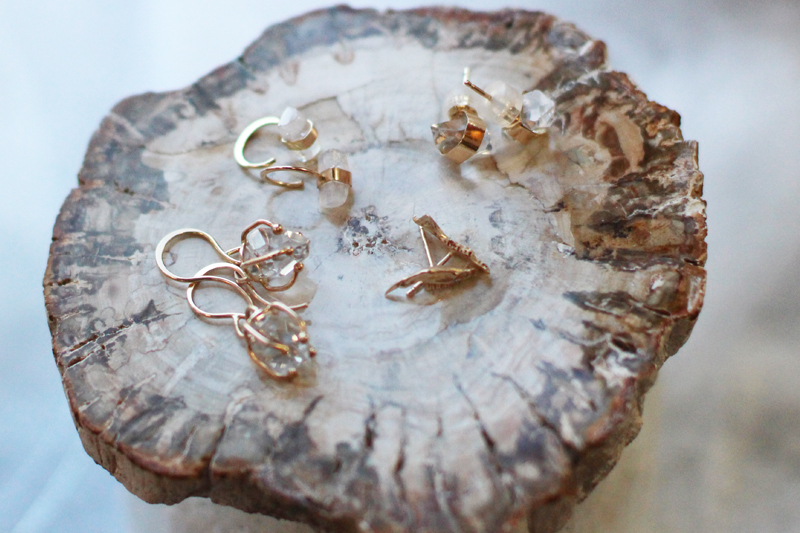 It’s been ages since my last jewelry DIY. It’s been a very busy summer. So I was excited when my friend Grace, of The Stripe, recently came to out to California for a visit and encouraged me to set aside a day dedicated to crafting. Sometimes, you just need that extra motivational push! 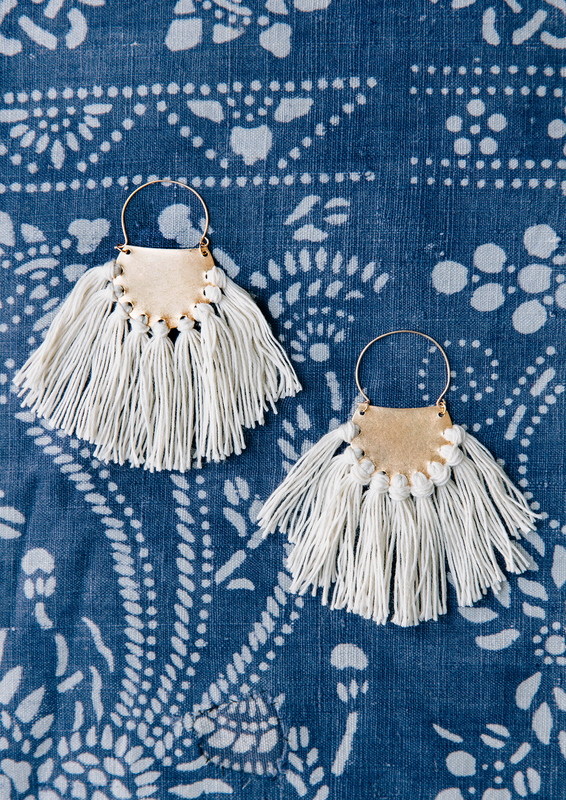 We both adore Portland designer Hazel Cox‘s brass and silk fringe earrings and were immediately inspired after spotting these perfect little brass discs at my favorite jewelry supply store. 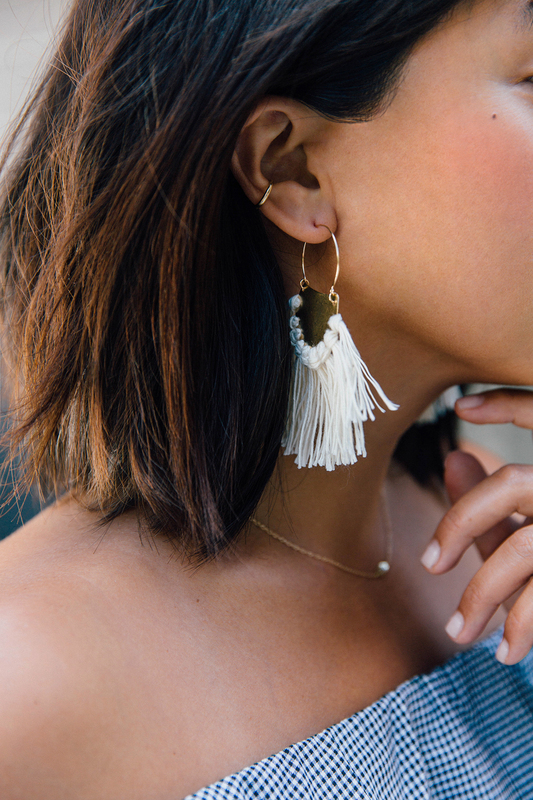 With the right tools, these exuberant earrings are so fun to make, I promise you’ll be inspired to make more than a single pair! 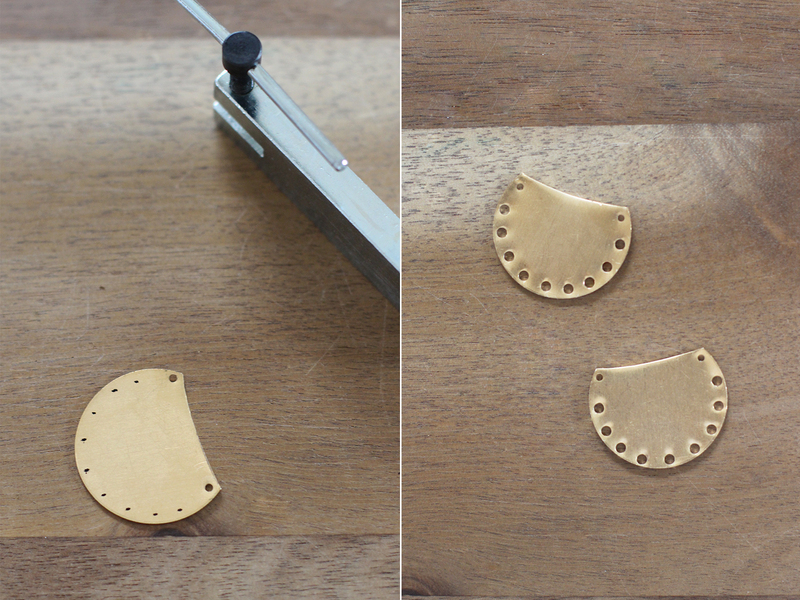 Start by taking a pair of metal shears and cutting off a section of the brass disc. You can cut it in half or do as I did and cut a little curved piece off the top. 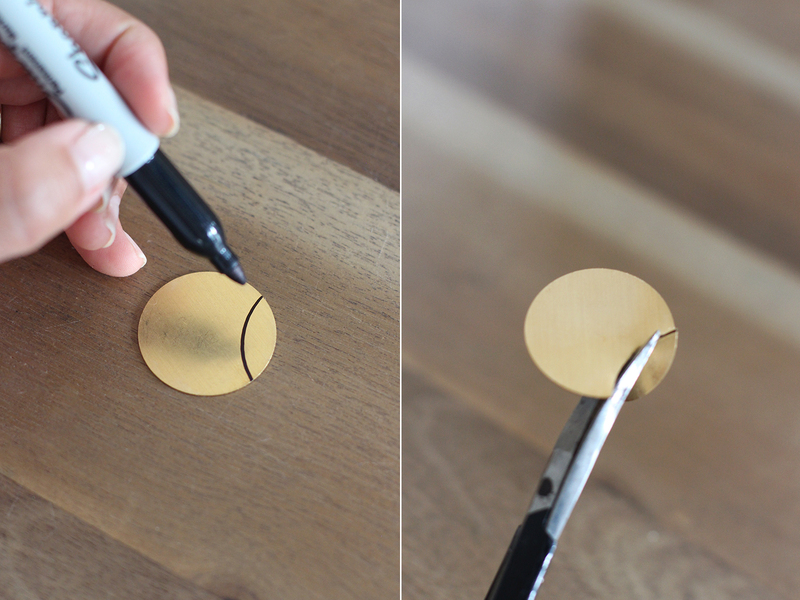 After cutting both pieces down to the same size, file down the cut edges with an emory board. With a Sharpie or permanent marker, mark 2 dots at each corner of the cut edge. 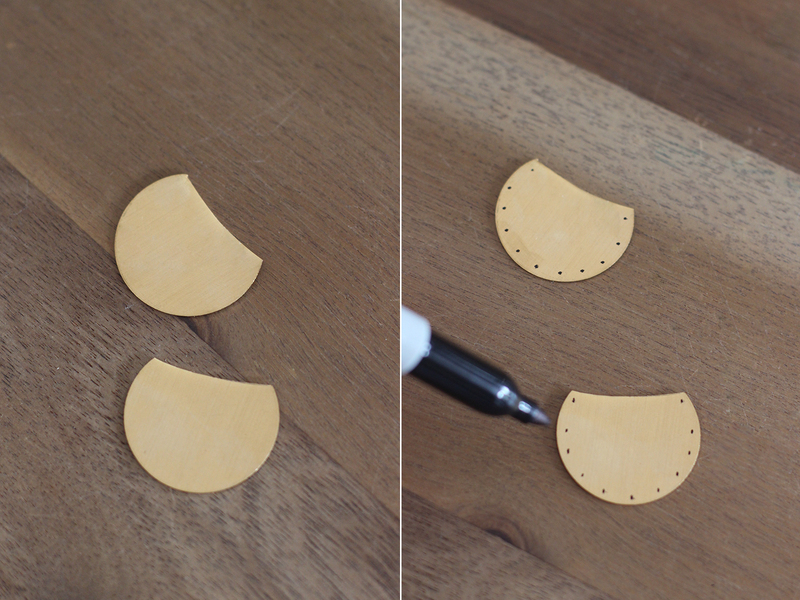 Then, make a series of evenly spaced dots around the bottom of the circular disc. Now comes the best part. I am so happy to have recently discovered this super convenient hole punch. It’s far easier to use than a Dremel, which is normally my tool of choice when drilling holes through metal. 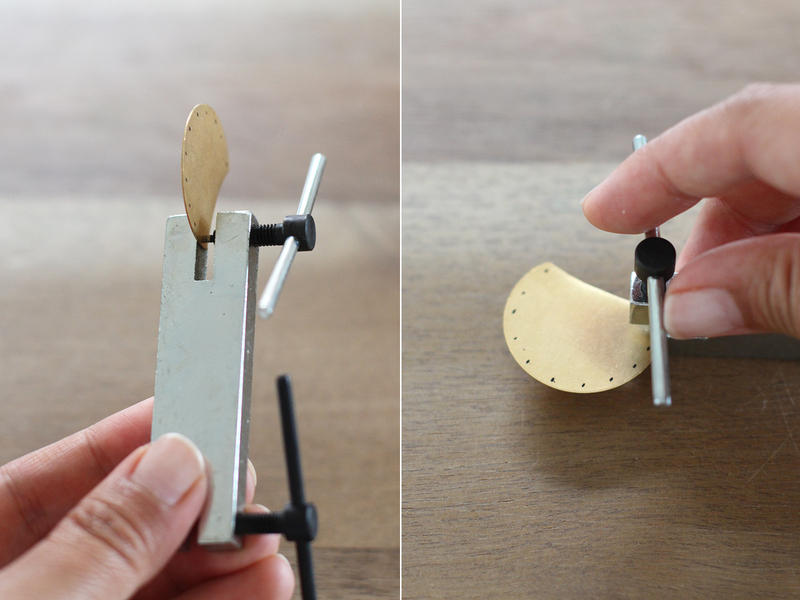 All you need to do is slide your disc through one side of the punch (one is a small hole, the other is a medium sized hole), turn the screw until you hear the metal being punctured. Unscrew and voila, that’s it! 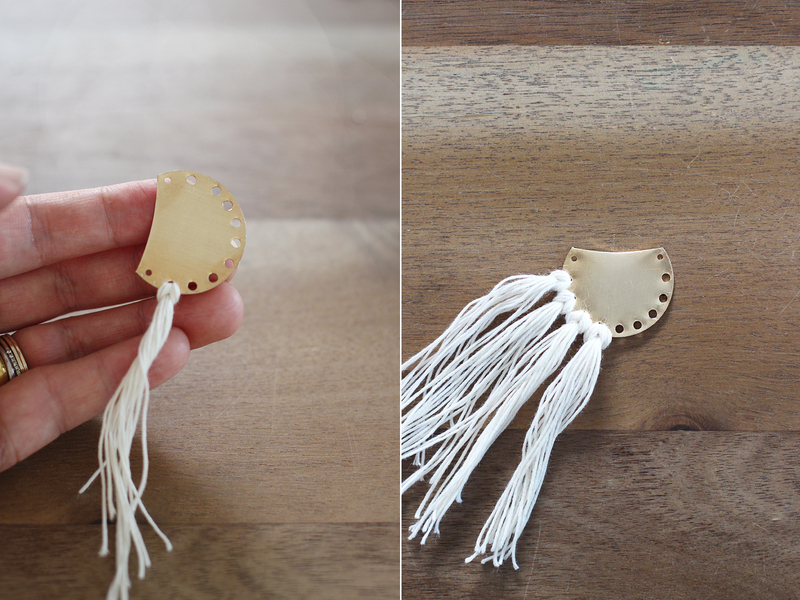 I recommend punching two small holes at the very top, where the earring will eventually be attached, and punching large hole around the disc, where the fringe will be attached. 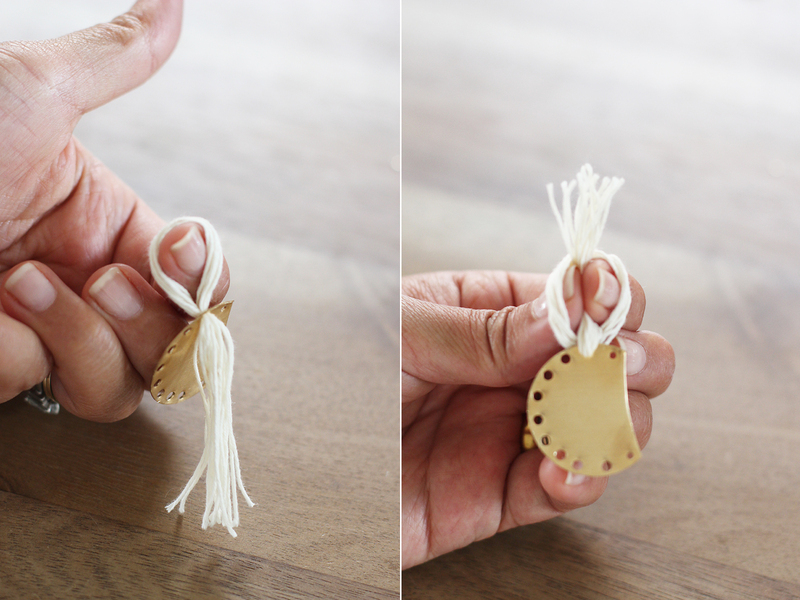 You’ll need a threading needle to fit the thread through each hole. 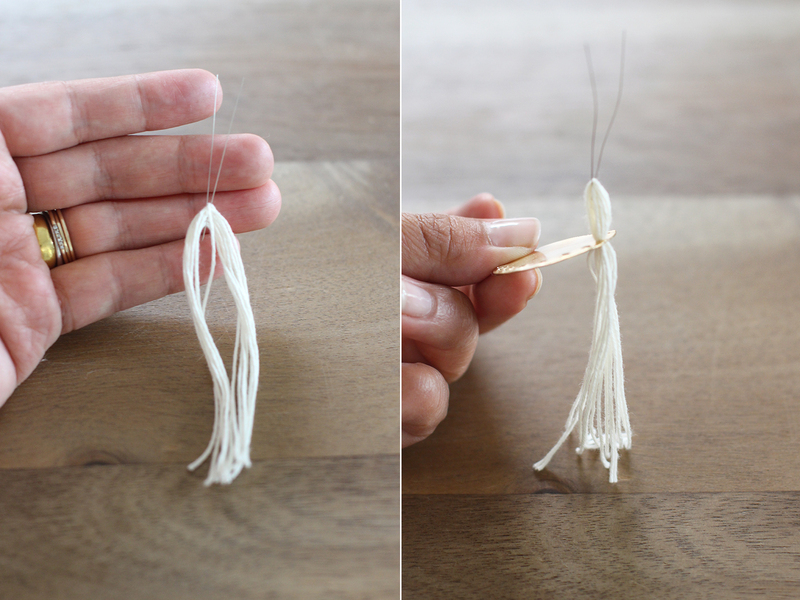 Snip the closed tip off the end of a big threading needle so it opens into a V. Take 5-7 strands of floss or thread, fold them in half over the threading needle and pull it up through the bottom of the disc. Remove the threading needle, pull the loop up there’s enough room to grasp the bottom of the threads. Pull them through the loop and pull tight. Continue adding sections of fringe. 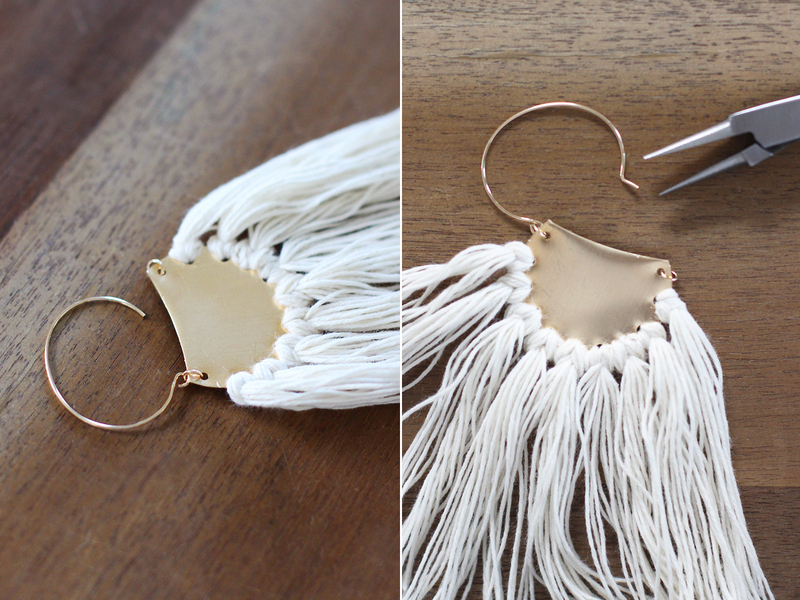 Once all the fringe has been added, just 2 jump rings to the top of each disc with flat nosed piers. Now the hoop earrings will be attached. 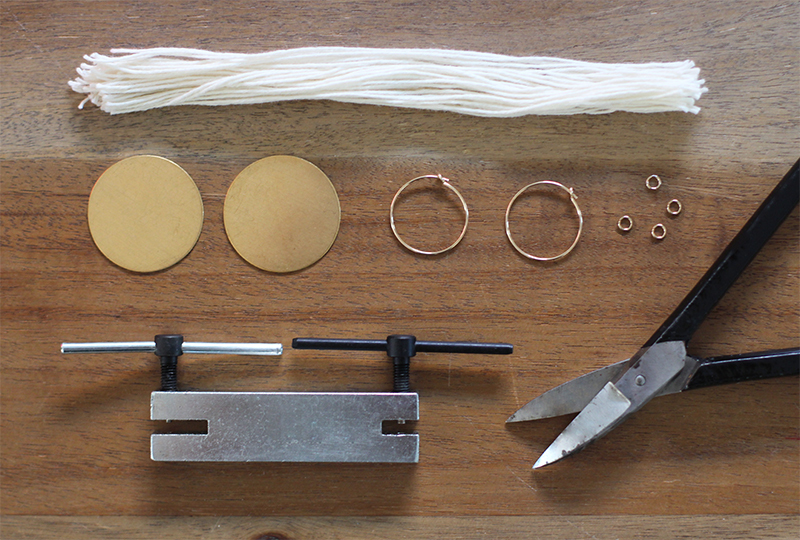 Use the pliers to rotate the loop on the earring 90° and attach it to a jump ring. Slightly bend the other side of the hoop with pliers so they lock inside the opposite jump ring. 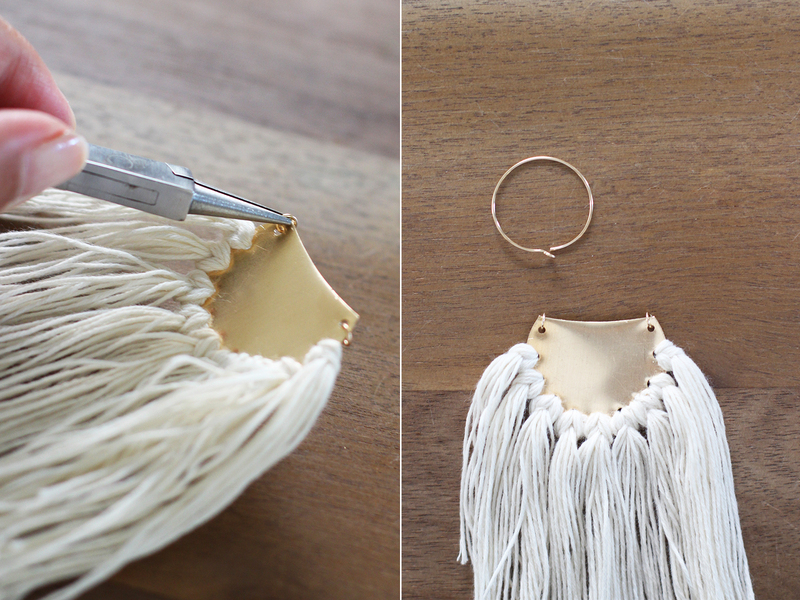 Trim the fringe and that’s all folks! 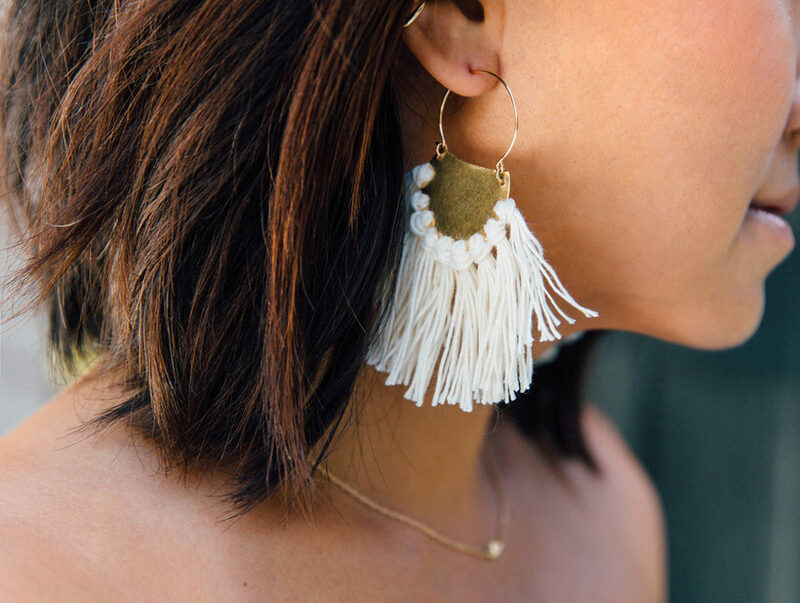 The fringe earrings look so cute! 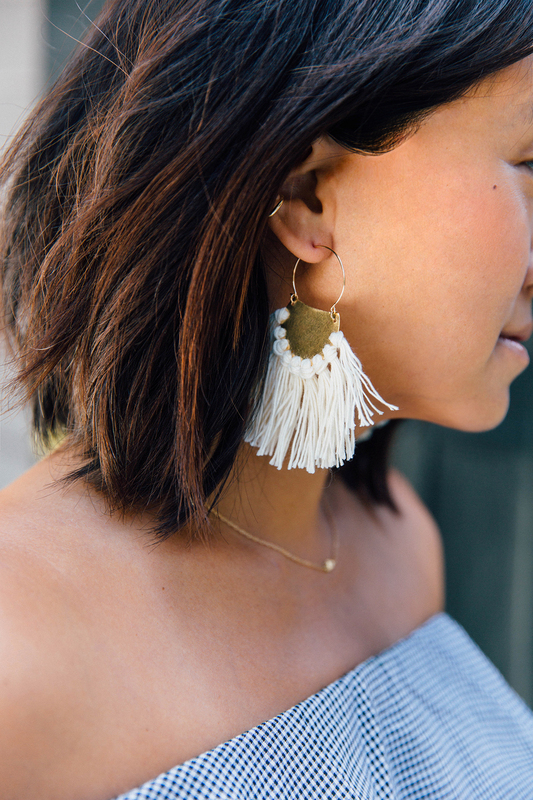 I am not very good with DIY but these fringe earrings are definitely so chic! Thanks for sharing! I would buy it since I am not great with DIY! so clever, they look great! Always great idea to make something with your own design……. These are pretty damn amazing. I’m not a DIYer at all (I definitely admire a good DIY). I actually want to try this one. Fingers crossed and hoping I can pull it off. Well done! Love the shape of it. ORIGINAL GONNA TRY THANK YOU FOR SHARING. THANKS FOR AT LEAST GIVING ME CREDIT FOR MY DESIGNS…. HOWEVER, IT HURTS EVERY TIME I SEE MY WORK TREATED AS A CRAFT PROJECT. I CAN GUARANTEE THAT THE QUALITY OF MY WORK IS OUTSTANDING, REFINED AND ELEGANT. 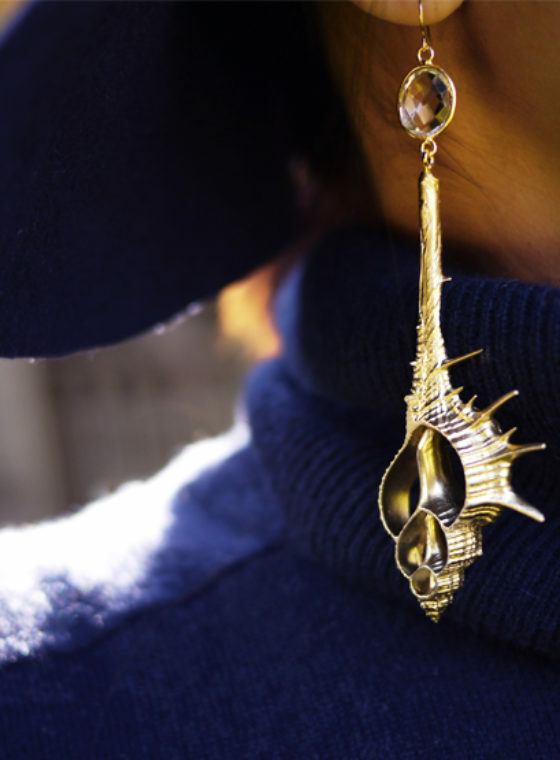 They earrings are adorable! Will definitely be making a pair, thanks for the tutorial! !